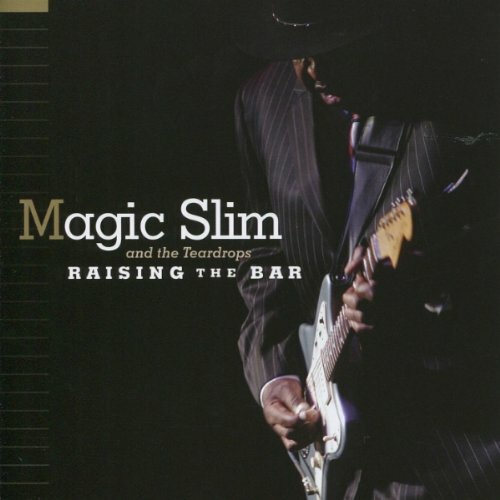 'Raising The Bar' may not quite live up to its name but if there were a bar separating Slim's better and lesser material, this would certainly qualify for the "better" pile. Magic Slim has been playing the blues for more than 50 years and been recording since 1977 with his band The Teardrops. The lineup has changed but the sound and purpose have not. With his 2010 release Raising The Bar, Slim declares not his intention to do it different but only to do it better. It's hard to imagine a 72-year old man and 50-year veteran still having a lot of upside, especially when you're talking about someone who has done it so well for so long but it's nice to know he still feels the fire to challenge himself and his band. "Part-Time Love" opens with a precision, rhythmic stutter that would make Rush and Yes proud before giving way to a slinky disco groove the late Rick James would have surely loved. Slim has the kind of presence at this point in his career that he can put something like that beneath him because no matter what he plays it's still going to come out as the blues. The relentless groove is irresistible whether he and his band are chanting the title or Slim is flicking a flurry of notes from his guitar. Later on the record, "Shame" has a little shake of its own. It's not built on the same dirty disco-funk rhythm but there's a muscular strut behind it that gives it dance potential. "Do You Mean It" and "I Can't Hold Out" are familiar constructions brought to life by Slim's commitment to raising that bar. "Do You Mean It" is fueled by some gravelly guitar lead and vocal and stickwork from drummer BJ Jones that is both flashy and muscular when needed. "I Can't Hold Out" is an Elmore James tune and it's a little interesting to hear that classic James intro played without the slide. It's a solid, spirited number that lacks surprise but not energy. Another fun cover on the album is his Slim'd version of J.B. Lenoir's "Mama Talk To Your Daughter." It may not be material you'd expect from a 72-year old man but Slim doesn't flinch. It's a good song and they play it well. The tale of the penitent prisoner has been a part of the music tradition for thousands of years. Johnny Cash helped make the murder ballad and tales of redemption and remorse from behind bars part of the language of popular music. "Cummins Prison Farm" is about a man incarcerated in one the most notorious prisons in American history and Magic Slim gives it an inspired interpretation. He doesn't act his age on this record, still playing those young man blues, but there is something about an older, veteran artist singing about redemption and pleas for freedom that resonate just a little deeper and more powerful. Magic Slim & The Teardrops are nothing if not dependable among current blues acts. They continue to headline blues events around the world and garner their share of nominations and awards year in and year out. One man's complacency is another man's consistency. Raising The Bar may not actually live up to its name but if there were a bar separating Slim's better and lesser material, this would certainly qualify for the "better" pile.